In just two weeks’ time, it’ll be all change for me as I leave the closest thing I have to a day-job to devote all my time to writing and marketing my books. In some respects there’ll be no change, in that my commute will be exactly the same: from bedroom to study, just six paces. But instead of working for the Alliance of Independent Authors (ALLi, as in “ally”), I’ll be working entirely for myself. In case you’re not familiar with ALLi, let me explain a little about what it is, what it does, and what I did there. 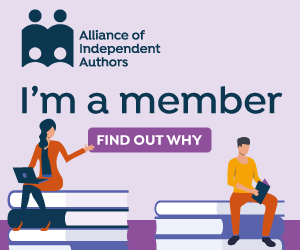 ALLi is a global, non-profit organisation for independent authors to share best practice and support, founded by Irish author and poet Orna Ross in 2012. In 2013, Orna invited me to be Commissioning Editor of its daily blog (www.selfpublishingadvice.org), and that role soon expanded. I moderated its members’-only advice forum, co-wrote self-help books for authors in ALLi’s series of guidebooks, wrote ALLi-related guest posts on other blogs, helped man its stand at the London Book Fair, and spoke on ALLi’s behalf at various festivals and writing events around the country. As an offshoot, I also started two writers’ groups, one in Cheltenham and one in Bristol, whose membership I had to restrict to ALLi members only to keep the numbers manageable. With a new blog post required every day, and to a specific deadline, my ALLi work had to take priority – and for a long time I hugely enjoyed it, not least because I was networking online daily with all manner of authors all over the world, and learning an enormous amount along the way, particularly from Orna herself, who had become a real mentor to me in my writing as well as in my role at ALLi. I also managed to fit in a reasonable amount of writing (I’ve published five novels in the last two years), public speaking on my own account, and running the Hawkesbury Upton Literature Festival, of which the fifth is about to take place (Saturday 27th April). However, around Christmas time, with my work-in-progress novel beset by a series of delays, I realised that if I was to achieve my long-term writng goals, something would have to give. I was operating on as little sleep and as little housework as I could get away with, and there were still never enough hours in the day. A series of minor illnesses (all now thankfully resolved) underscored the message that I was simply trying to do too much. For years people had been saying to me “I don’t know how you do it all” – it just took me a while to agree with them. Coming soon – honest! The first in my new series of novels. Orna and the team at ALLi have been gracious and generous as we’ve worked on a handover, and I’ve been vastly amused to discover I’m being replaced by not one but three people! (Ok, so they’re all working part-time on what I used to do, but the thought still made Orna and me laugh.) I will continue to be ALLi’s UK Ambassador, and to write and speak on the organisations behalf now and again, but apart from that I will be my own person. If I don’t get as many books written as I plan, I will have no excuse, and no-one to blame but myself! So watch this space – and if you’d like me to alert you as I release new books, please click here to join my Readers’ Club, and I’ll keep you posted of progress. I’ll close now with Orna’s version of this news, over on the ALLi blog. She is very kind! Countdown to the 5th Hawkesbury Upton Literature Festival! The idea was to bring together a few author friends for an evening of talks and readings in one of our local pubs. What started out as a sedate two-hour schedule quickly overflowed into five hours, to allow time for all who wanted to take part. These included illustrious guests such as the bestselling romantic novelist Katie Fforde, who kindly accepted my invitation to declare it open, and Orna Ross, bestselling historical novelist and poet and founder of the Alliance of Independent Authors, for which I’m UK Ambassador. Always eager to please, I fell in with all of those suggestions. Five years on, here we are a month away from the most ambitious Hawkesbury Upton Literature Festival yet, on Saturday 27th April. That modest evening in the pub has morphed into a village takeover, with events now scheduled simultaneously in six venues, with different things starting on the hour every hour from 10am through 5pm. Over seventy authors and artists will be taking part in talks, discussions, readings, a poetry slam, an art exhibition, children’s events and a series of workshops. We’ve gained huge local support, including sponsorship from local individuals and organisations – the Hawkesbury Parish News, Head Start Studio, Hawkesbury Writers, Sid Crighton of Orange Dog Studio – and also from the globetrotting travel writer Jay Artale, who is managing our Twitter account from wherever she is in the world! (See our list of sponsors here.) Their generous support and encouragement has enabled us to keep the Festival free to attend, while increasing its reach and appeal. Just a month to go! Save the date and come and join the fun – it’s all free! If you’d like to attend, no prior booking is necessary – just come along on the day. Head for the Village School, the hub of the Festival, to grab your programme and venue map. Even better, download them now from our website to plan your day in advance, so you don’t miss any of the events that especially appeal to you. You can also keep up with Festival news on Twitter at @HULitFest. And if you’re not yet convinced that a day at a small provincial lit fest is worth your while, read my guest post on the Oakwood Literature Festival website about what makes these events so special: What Do Small Lit Fests Offer that Big Ones Don’t? I’ll be speaking at the second Oakwood Festival on Saturday 18th May, and in the meantime at the Wrexham Carnival of Words on Thursday 2nd May. For some time I’ve been planning to write a series of novels set in a traditional girls’ boarding school, and today’s cover reveal is a hint that I’m going to be launching the first of these, Flat Chance, very soon. As a child, like many of my generation, I loved books set in schools. Mavourite was Anthony Buckeridge’s Jennings – what was yours? But my series will be for adults, and the focal point will be the staffroom rather than the classroom or dormitory. Led by a charismatic maverick headmistress, each of the eccentric staff is hiding a different secret, including new recruit Gemma Lamb. Gemma’s other potential career choices included lighthouse keeper and nun – any job, in fact, that provided a roof over her head. The Staffroom at St Bride’s series will be lighthearted and gentle, with a touch of romance and a lot of comedy. But I’m not planning any murders, not only on the grounds of good taste but also for credibility. Would you send your child to a school in which the school roll keeps reducing due to assassinations? I certainly wouldn’t. Besides which, I don’t really like killing people – which will reassure my family and friends! I’ve commissioned the wonderful Rachel Lawston of www.lawstondesign.com for the series’ cover designs, because I am so pleased with her treatment for my Sophie Sayers Village Mystery series. She has cleverly come up with something that echoes the branding of the Sophie books, making it clear that these come from the same stable, while establishing a new and different setting – just a bike ride away from Wendlebury Barrow, home to Sophie. And yes, Gemma and Sophie will have the chance to meet! And speaking of deadlines, I’d better get back to inputting my edits to the final manuscript!